1. Asstt. Registrar - Masters’ Degree in any discipline with at least 55% or its equivalent grade of ‘B’ in the UGC 7 point scale from a recognized University/Institute. Prescribed application may be downloaded from the Institute’s website www.iitism.ac.in and submitted to the Deputy Registrar (Estt. 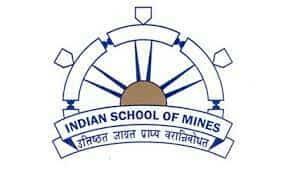 ), Indian Institute of Technology (Indian School of Mines), Dhanbad, Dhanbad - 826 004 (Jharkhand); along with necessary fees by way of a crossed demand draft of RS. 100/- drawn in favour of “Registrar, IIT(ISM), Dhanbad” payable at Dhanbad SC/ST/PH candidates are exempted from paying application fee.